1 of 8 Heat oven to 300 degrees F. Butter eight 4-ounce broiler-proof souffle dishes. 2 of 8 Heat heavy cream, cream of coconut, nutmeg and salt in saucepan until small bubbles appear around edge of pan. 3 of 8 Mix yolks, eggs, sugar, vanilla, rum and flake coconut in bowl with a fork until well blended; be careful not to incorporate a lot of air bubbles. 4 of 8 Slowly add hot cream mixture to egg mixture, stirring to combine. Divide into dishes, 1/4 cup each. 5 of 8 Place souffle dishes in baking pan with 2-inch-high sides; place pan on oven rack. Pour enough hot water into pan to come halfway up sides of souffle dishes. 6 of 8 Bake in 300 degrees F oven 40 to 50 minutes, until knife inserted in centers comes out clean. Remove dishes to rack to cool. Refrigerate at least 1 hour. 7 of 8 To serve, heat broiler. 8 of 8 Arrange sliced bananas on top of each custard. Sprinkle each with sugar. Broil 1 inch from heat, just until sugar bubbles and browns, 1-1/2 to 2 minutes. 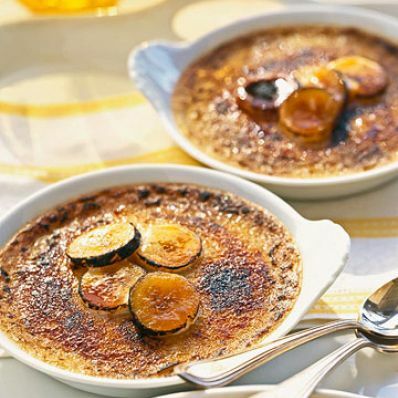 If necessary, use inverted 13 x 9-inch metal baking pan to raise souffle dishes so tops of custards are 1 inch from heat.